Our logo is provided free for use by our supporters, feel free to download our We Ride Australia logo and use it as widely as possible. When using our logo on your website, where possible, all URL links should be directed to our Home Page. 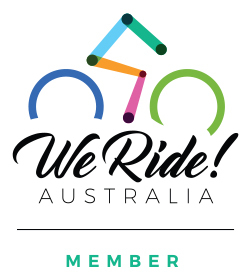 Provided for use by our Members who applied for membership after 1 April 2018. Provided for use by our Foundation Benefactors only, as recognised on our Honour Roll. 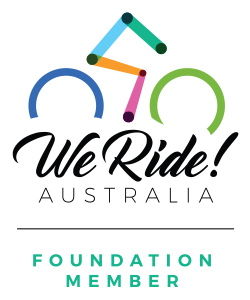 Provided for use by our Foundation Members only, as recognised on our Honour Roll, who were members prior to 31 March 2018. If you applied for membership to our organisation after this date, please use the general “Member logo” in the section above. If you require high resolution logo images for the purposes of print or large media, please contact Phil Latz (Development Director) using our Contact Us form. To download these images, please hover over the image you require and then right click on your mouse. Select ‘Save Image As’ and then navigate to the the folder or location on your computer you wish these images to be stored and click ‘Save’.